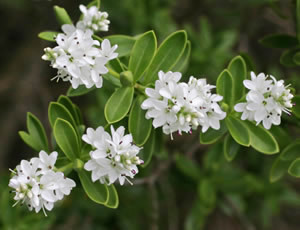 Hebe brachysiphon forms a compact evergreen shrub, which grows to about 40 in (1 m) high. The green spear-shaped leaves are about an inch (2–3 cm) long, and 0.25 in (6 mm) wide. The flowers are white. Hardy, and suitable for use as a hedge in the UK. The name brachysiphon means 'short tubed', which refers to the flower. This is compared to Hebe traversii. Hebe brachysiphon is closely related to Hebe venustula, and is found in Canterbury, South Island, New Zealand.